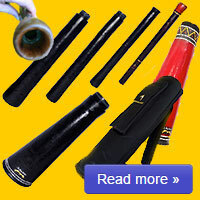 Which Pro Didgeridoo is best for you? 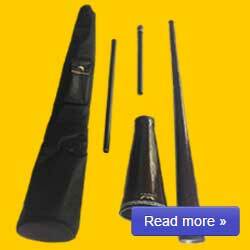 Both Didgeridoos are well crafted in Carbon fibre with a real wood mouthpieces with aluminium fittings which can be played in different keys without having to change instruments. They are like having 12 didgeridoos in one pack! Now you can play in most every key! 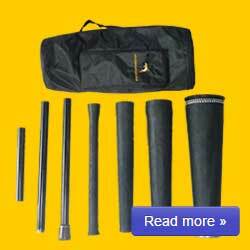 Lightweight and portable designs (3.5kg – 4kg – including bag) travel friendly and suitable for most playing situations. Strong and durable.The sound is full, resonant and has great back pressure making it easy to play toots in all keys. Fun for all ages and great for players at any level.AVAILABLE IN 3 COLOURS – BLACK, RED, BLUE or DOLPHIN. 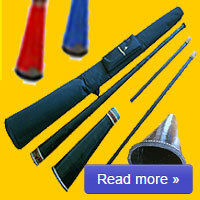 Which Didgeridoo is best for you? Both Didgeridoos are well crafted in Carbon fibre with a real wood mouthpieces which can be played in different keys without having to change instruments. They are like having 12 didgeridoos in one pack! Now you can play in most every key!Lightweight and portable designs (2.5kg – including bag) travel friendly and suitable for most playing situations. Strong and durable. The sound is full, resonant and has great back pressure making it easy to play toots.